Where in the world can one go toe to toe with celebrities and see strange and unusual items from all across the globe? The answer of course lies in the state of the art, interactive Ripley’s Believe It or Not at San Antonio, Texas. 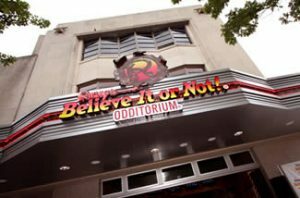 Just across from The Alamo and against the San Antonio River Walk, Ripley’s Believe It or Not is not only accessible but offers visitors a memorable experience. Many individuals recognize the name from the famous travel tome full of oddities and wonders, and the physical location upholds the book’s standards to the tee. Within the Ripley’s family the area features many different unique tourist attractions such as the Guinness World Records Museum or Louis Tussaud’s Wax Works Museum. Each of these offers their own unique experience, and although each may bear their own ticket price, one would certainly want to see what the whole of Ripley’s has to offer. The Guinness World Records Museum, for instance, is what resembles the famous book the most with 10,000 square feet of exhibits, videos, games, and artifacts all devoted to world records. Ripley’s Haunted Adventure is a state of the art, million dollar haunted house like no other. Inclusive of this attraction visitors will be exposed with live actors, elaborate stages, animatronics, and special effects which all work together to bring the haunted story to life. Visitors that don’t have a taste for the fear-inducing can instead take pictures with wax celebrities in Louis Tussaud’s or ride through ancient tombs in Tomb Rider.